Since 1957, Council 112's hall has been located in a former Lutheran church at the intersections of Bradley and Penacook Streets in Concord, New Hampshire. It was purchased by PGK Thomas M. Degnan, with the support of the membership. The Grand Knight for the 2018-2019 Fraternal year is Chuck McGee. You can contact the Knights by phone at (603) 228-8927. Council #112 traces its origins back to March 17, 1895 when a group of thirty-nine Catholic men from both St. John the Evangelist and Sacred Heart parishes were granted a charter by the Knights of Columbus Supreme Council. Dennis Donovan served for two years as the first Grand Knight. The Council worked closely in support of four Church's in Concord: Immaculate Heart of Mary on Loudon Road, as well as St. John the Evangelist, St. Peter's and Sacred Heart. 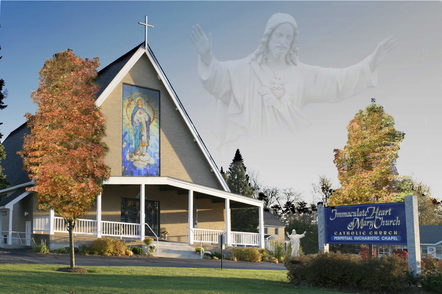 Since the Catholic Church has gone through many changes within the State of New Hampshire, the Diocese of Manchester has closed Sacred Heart and St. Peter's Church's, and the two remaining, Immaculate Heart of Mary and St. John's (now Christ The King) are the last two remaining Catholic Church in Concord, that Council #112 supports, in addition to the Carmelite Monastery on Pleasant Street. Council 112 provides funds for various projects such as memorials, CCD programs, scholarships for local students, tournaments, communion breakfasts, Special Olympics, cancer research, Operation Santa Claus, and visiting hospital patients. Members are active participants in their respective parishes as organists, cantors, lectors, ushers, teachers, and Eucharistic Ministers. The Knights of Columbus is the world's largest Catholic lay organization, with more than 1.7 million members in the United States, Canada, Mexico, Central America and the Caribbean and the Philippines and Poland. Last year, the Knights donated more than $139 million and over 64 million hours of volunteer time to charity. we want you back !!!! Your Grand Knight, Chuck McGee, invites you to come to the council business meeting, and participate in the discussions of and decisions made on events and activities in which the council is involved. As a member in good standing (in possession of a 2018 member card), you are always welcome. The meeting will begin at 7 PM and will be completed at or very near 8 PM. Refreshments will be available after the meeting in the kitchen and club room. Our NEW meeting location is at Immaculate Heart of Mary Catholic Church on Loudon Road. Our meeting will run about an hour. The College of Saint Mary Magdalen initially launched this initiative in the spring of 2014 with the goal of making a faithful Catholic education more affordable to prospective students. "The success of the Free Room and Board Initiative and the quality of the students who have enrolled this year as a result has prompted the College to extend the initiative for another recruiting cycle," said Dr. George A. Harne, President of the College of Saint Mary Magdalen. Free Room and Board will be guaranteed to any student who participates until they graduate or leave the College. Over the past 25 years the cost of tuition in the United States has sky-rocketed and through the Free Room and Board Initiative the College of Saint Mary Magdalen hopes to make a true liberal arts education accessible to students who may not have been otherwise able to afford it. The reduction in cost represents an $8,000 discount worth more than $25,000 over four years. The College has a rolling admission process and will be actively accepting students throughout the school year. Now is the perfect time to build your financial portfolio. There are annual scholarships in the amount of ($750), awarded by the New Hampshire State Council for eligible students. Memorial's can be found under "Programming" to "Council Programming" to "Good of the Order"
Mike Geary, Oscar Serard, Martin Tully ... and all of those who are in need of your prayers, support and guidance. NEW PHOTOS have been posted on "Events Photo Recap" and "Knights Photos"
We've posted a list of your Council #112 Brother Knights, who will be celebrating their Birthday during the month. Please take the time, if you can, to contact any one of these Brothers, to wish them a GREAT day, and congratulations on a another great year. I'm sure they would love to hear from you! At the Council's recent Awards Banquet, Grand Knight, Chuck McGee awarded Oscar Serard, the "Knight of the Year" award. At the Council's recent Awards Banquet, Grand Knight, Chuck McGee awarded Mr and Mrs Matt Cyr and Family, the "Family of the Year" award.